Along with the pubs and the beer, you’ll have to put up with some literature as well," says Derek Reid, making sure there were no illusions about the evening. Not that anyone would be complaining. Dublin, after all, has produced four Nobel laureates in literature—the most for any city in the world—and venerates its writer-sons with a passion usually reserved for political leaders elsewhere. Its streets are studded with statues of Oscar Wilde and James Joyce, it celebrates Bloomsday (after the protagonist of Joyce’s Ulysses, Leopold Bloom) and preserves writers’ residences as museums. It’s as feasible to be in Dublin and ignore its literati, past and present, as it is to visit New Delhi and overlook its history. “What’ll you have, will you have a pint? Yes, I’ll have a pint with you, sir. We’ll both be thrown out of the boozer." Moods considerably lighter, pints of Guinness in hand, we reach the hallowed courtyard of Trinity College, established in 1592 and alma mater to Wilde, Beckett, Ernest Walton and Oliver Goldsmith. The snivelling drizzle is now a downpour, but Jessica manages to get the laughs as she describes Wilde’s escapades at the college and reads out letters written to friends and family while the writer was on a tour of America. But the cans are emptying fast, and it’s time to move on to the next pub. But not one devoid of literary history. O’Neill’s, on Suffolk Street, is a Victorian building that has doubled up as a second home for generations of Trinity scholars. A comfortable college tavern in every way, this one has the reputation of having served the best Irish beer for 300 years. Twenty minutes and a pint—or more—later, we regroup under the stone portico of the former St Andrew’s Church, now the headquarters of Dublin tourism. Jessica and Derek take up position on plastic milk containers and launch into street skits contextualized in the 1913 Dublin Lockout, a labour dispute. One pokes fun at the social distinctions of churchgoers: A panhandler advises another: “When approaching passers-by for beer money, it’s important to tell the difference between a Catholic (generally of the employer’s party) and a Protestant (usually union sympathizers). If he looks fat, he’s Catholic. Of course, Protestants are sometimes fat, too, but they never look it." Our third pub for the night is the Old Stand on Exchequer Street which was, for generations, an integral part of Dublin’s community life. The passing years have only served to enhance its reputation: Because of its location in the epicentre of the city’s rag trade, it probably attracts a wider female clientele than most city pubs. It is also the after-hours haunt of Dublin’s financial sector, a favourite of bankers, stockbrokers and lawyers alike. 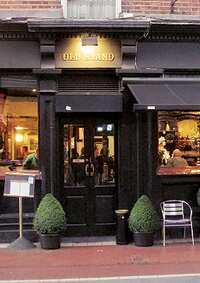 The pub wears its historical and contemporary avatars with ease: The interior is split down in the middle, with a wooden horseshoe-shaped bar and old-fashioned hanging green lamps lending a quiet, distinguished air to the Old Stand and vibrant party-makers making a beeline for the hip Select Bar. Just as we’re wondering if we are walking to drink or drinking to walk, Derek throws a challenge to our Guinness and Scotch-addled brains: “Beckett was born on a holy day around Easter. Many critics have let it influence their interpretations of his works. On which day was Beckett born? Not the date, the day." As if that’s not enough of a teaser, he poses another question: “The movie Michael Collins starred Liam Neeson in the title role and Julia Roberts as his fiancée, Kittie Kiernan. A relative of the real Kittie Kiernan was the owner of The Duke pub, back when it was called The Dive. 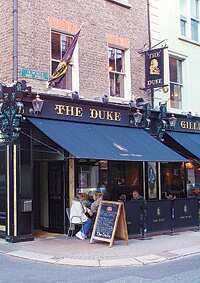 Which relative of Kittie Kiernan owned The Duke?" All along the crawl, the group discusses possible answers even as independent conversations flourish. It’s quite surprising, really, how Guinness works to sharpen the grey cells. The last pub-stop comes at Davy Byrnes, just off Grafton Street. With more than a century of history, the pub was a favourite of Anglo-Irish writers such as Oliver St John Gogarty and James Stephens, but it was Joyce who put it on the world literary map with multiple mentions in Ulysses. The pub pays its homage by retaining its pre-World War II decor and murals of Joyce’s Dublin on the walls. Even for those of us who haven’t waded through Ulysses, it’s something of a moment to know the genius was here, same as us. We come full circle to The Duke, and the quizzing begins in right earnest. “There are four Nobel Prize for Literature winners from Dublin: William Butler Yeats, George Bernard Shaw, Samuel Beckett and Seamus Heaney. One lent his name to a horse which won a major race in 2006. Who are we talking about?" “Which nursery rhymes did Oliver Goldsmith write?" “Beckett worked on the original script of the musical Oh! Calcutta, but dropped out before it went into production. When he left, the Beatle who was working on it also quit. Which Beatle collaborated with Beckett on Oh! Calcutta?" Guinness obviously agrees with me (or maybe it’s the Indian obsession with trivia): I win a cool Dublin Pub Crawl tee with my answers. More than that, though, the two and a half hours forge new bonds and create new drinking buddies. Some of us go on to cement the friendship at The Duke, but I prefer to go back to Davy Byrnes for an awesome gorgonzola-and-mustard sandwich. Oh, the answers? In order, Good Friday, mother, Yeats, Jack and Jill and Hickory Dickory Dock, John Lennon. Nope, there are no spoilers here. Dublin has enough literary history to have you coming back for more. KLM flies to Dublin via Mumbai and New Delhi via Amsterdam. Fares start around Rs45,000, including taxes. I put up at O’Callaghan Stephen’s Green Hotel (http://www.ocallaghanhotels.com/dublinmain/stephens_green.aspx; Tel: + 353 1 6073600). Incorporating two historically listed Georgian houses, Stephen’s Green Hotel is a boutique hotel in Dublin’s city centre. Besides all the usual amenities, it has a thematic gallery of famous playwright George Fitzmaurice. The Pie Dics restaurant and the Magic Glasses bar are named after two of his works. Rates start at €285 (about Rs15,000). Merrion Hotel (http://www.merrionhotel.com Tel: +353 1 6030600), a five-star, starts at €475/night. It’s a grand hotel overlooking the exquisite Merrion Square park. Within walking distance is Dublin’s “golden mile", with lively pubs and great shopping. On Sundays, the Merrion Square Park comes alive with open-air exhibitions of local artists’ paintings. Another option is the 200-year-old classic Gresham Hotel (http://www.greshamhotel.com Tel: +353 1 8787966) located on O’Connell Street in Dublin’s City Centre. The hotel is close to Grafton Street and Temple bar areas. Rates start at €130/night. Dublin’s fine restaurants and cafes offer every conceivable type of food. The Temple Bar area is a great place for fine dining. Dublin is famous for seafood. Wash down steaming fresh mussels, white crab claws and oysters with liberal helpings of Guinness. Must-try: Irish Crème Coffee Torte, Irish Whisky Cake with a large glass of Irish coffee comprising hot coffee, Irish whisky, sugar and whipped cream. Note: Dublin is now Europe’s first smoke-free capital city. All Dublin pubs, nightclubs, restaurants and cafes are now smoke-free zones. Walk. Take the cobbled streets and visit Trinity College and do a historic tour of the Guinness storehouse (a tour of this beer manufacturing centre comes with a complimentary Guinness), walk around Temple bar to enjoy funky shops and eclectic cafes, visit the 13th century Dublin castle (the seat of Irish monarchy), walk along O’Connell Street and enjoy its exhilarating ambience. Don’t forget the National Museum of Ireland, which houses artefacts dating from 7,000 BC to the 20th century) and the National Gallery of Ireland for a fine collection of European paintings. Sign up for the Dublin literary pub crawl at the city tourism centre at St Andrew’s Church on a first-come-first-served basis. It starts at 7.30pm every day between April and November, plus at noon on Sundays, and Thursday-Sunday from December through March. Charges: €12, exclusive of food and drink.